Segger has released a beta version of the J-Link software which includes their GDB thread awareness for embOS and FreeRTOS :-). I had a first chance to try this plugin at NXP FTF 2016 in Austin (see “FreeRTOS Thread Debugging with Segger GDB in Eclipse“). Now that feature is included in the latest Segger beta download. This article describes the steps how to use it with the NXP Kinetis Design Studio (V3.2.0) with the GNU ARM Eclipse plugins. Similar steps can apply for other Eclipse distributions with GDB. A similar feature is present in OpenOCD (see “FreeRTOS Thread Debugging with Eclipse and OpenOCD“). For Mac OS X and Linux you have to copy the necessary files from the installation folder. The RTOS thread awareness is using DLLs/libraries from the ‘GDBServer’ subfolder. 💡 The path is relative to the Segger GDB server. If you have located the plugins elsewhere, you have to adopt the path. 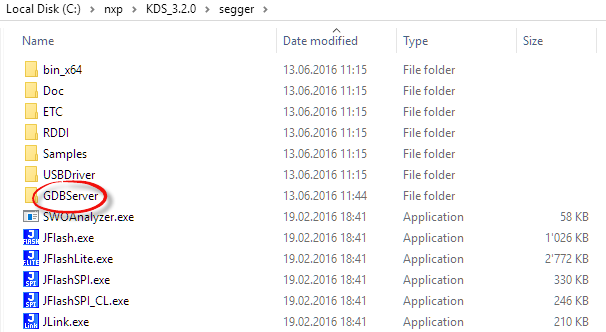 The Segger RTOS plugin provides a very convenient way to debug FreeRTOS (or Segger emBOS) threads with Eclipse and GDB using a Segger J-Link debug probe. A native J-Link or an embedded J-Link probe like OpenSDA on the NXP Freedom boards. It greatly simplifies the debug experience, and after using it I don’t know how I was able to debug RTOS applications before ;-). This entry was posted in ARM, CPU's, Debugging, Eclipse, Embedded, Freescale, KDS and tagged arm gcc, Debugging, Eclipse, FreeRTOS, gnu gcc, J-Link, Segger, technology, Thread Awareness, Tips&Tricks by Erich Styger. Bookmark the permalink. Erich, I’m very excited to try this, but we’re using stock Eclipse and I didn’t see that pop up as an option with the prompt to “update existing IDE’s using Segger J-Link software”. to point to the Segger files. These variables are usually configured under Window > Preferences > Run/Debug > String Substitution. Just make sure they point to your J-Link software with the FreeRTOS plugins/version. ERROR: Mandatory symbol uxTopUsedPriority not found. Researching online tells us that uxTopUsedPriority is a symbol is no longer used with the latest version of FreeRTOS. It appears to now use uxTopReadyPriority instead. But, we’re not sure how to get the debugger to use this new symbol. Any suggestions? No, the symbol uxTopUsedPriority has to be present. * linking) to your LDFLAGS; same with all the other symbols you need. Well, unfortunately that didn’t get us any farther. We’re currently unfamiliar with –gc-sections and LDFLAGS, but tried adding a few combinations to the makefile without success. We’re relatively new to the whole makefile concept. So, I’m guessing it’s something very basic that we’ve missed. If you have any further suggestions, we’d love to try them. As always, thanks for all your articles. I’ve found them very helpful. I’ve been reading your articles for a little while now, and they are great! Keep up the great work! this feature of thread awareness helps with ‘stop-mode-debugging’: you see the threads when you stop the debugger, and you can switch between them. A rather simple but important thing which does not need affect RAM/ROM/execution on the target. 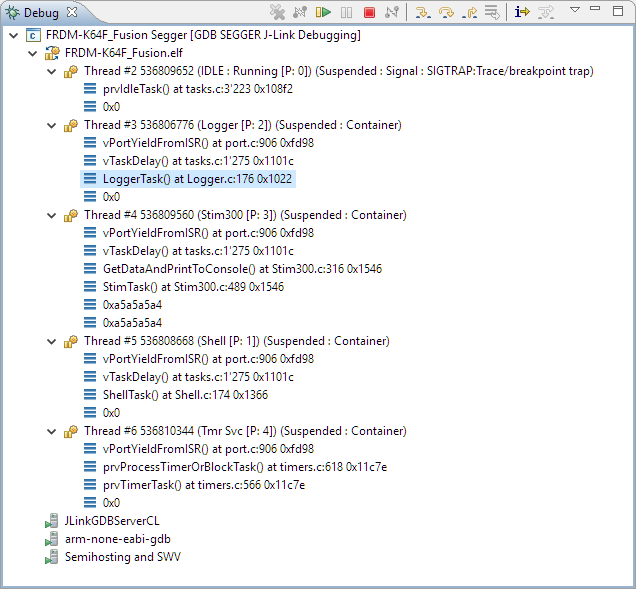 The Segger SystemView is more than that: it records and shows all events (see https://mcuoneclipse.com/2015/11/16/segger-systemview-realtime-analysis-and-visualization-for-freertos/ and https://mcuoneclipse.com/2015/07/07/using-segger-real-time-terminal-rtt-with-eclipse/): here you can see the flow of threads, the events and lots of other things. The only small downside is that this needs RAM/ROM/execution cycles on the target, in the range of 1-2%. Thank you for sharing this! We have successfully loaded all the symbols and can debug, pause and resume, but when we pause we do not see all the task threads. We only see the active thread. In addition in the console of Eclipse we see “ERROR: Null stack pointer in task.” and a number of “WARNING: Mis-aligned memory read: …”. Any ideas what could be wrong with our setup? We are running on Macbooks with macOS and using J-Link Plus debuggers with the latest software from Segger. We are compiling our target with GNU ARM GCC and debugging with a .elf file. What Cortex are you using? The M0+ would hardfault with a misagligned stack, but the M4 would do two fetches (not good for performance). Are you sure your task stacks are properly aligned? The usual ports ensure this, but I’m not sure what port you are using? We are using Nordic’s nRF52 which is an M4 and their port of FreeRTOS provided in their SDK. It is possible their port has some minor issues. I will try your suggestions and investigate more later today when I get a chance.